Dr. Bhavik Pandya graduated in 2005 with Bachelors of Dental Surgery from a well recognized dental school in India. He further pursued Doctor of Dental Medicine from prestigious Boston University in 2010, where he was awarded for the Excellence in Practice and Patient management. Dr. Pandya provides comprehensive dental care and is committed to restorative, endodontic and surgical procedures. He believes in patient oriented treatment in a very friendly and encouraging environment. Dr. Pandya is a very firm believer of Ethics. 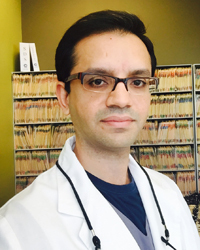 Dr. Pandya is a member of American Dental Association and keeps current with advance treatment & procedures by regularly attending continuing education courses. He is married to his lovely wife for three years. He enjoys astronomy & observing wonders of skies through telescope.